People People, a unique Swedish startup, is planning on bringing its new home audio system into your living room without clogging up your view of things. As the name implies, People People's Transparent Speaker is a speaker system designed with a see-thru glass housing giving you the opportunity to enjoy the inner workings and the environment behind it. Inside, the Transparent Speaker features high-end hardware like a 6.5-inch subwoofer with an amplifier, two 3-inch full range drivers and a machined aluminum control panel complete with treble, bass and volume adjustment knobs. The Transparent Speaker is Swedish design and simplicity as its finest. While you can plug in your audio source via two standard 1/8" and 3.5mm auxiliary inputs, there's also a USB port for hooking up a Bluetooth dongle if you'd like to go wireless. There's even a special slot that can house an Apple Airport Express for superior AirPlay music streaming over a WiFi network. People People's minimalist Transparent Speaker will come in either a complete and fully assembled package for $490, as well as in a do-it-yourself kit which you will need to put together yourself Ikea style, for $360. You'll also need to supply your own glass panels to make up the speaker housing which is kind of a deal breaker unless you're into the whole DIY thing. 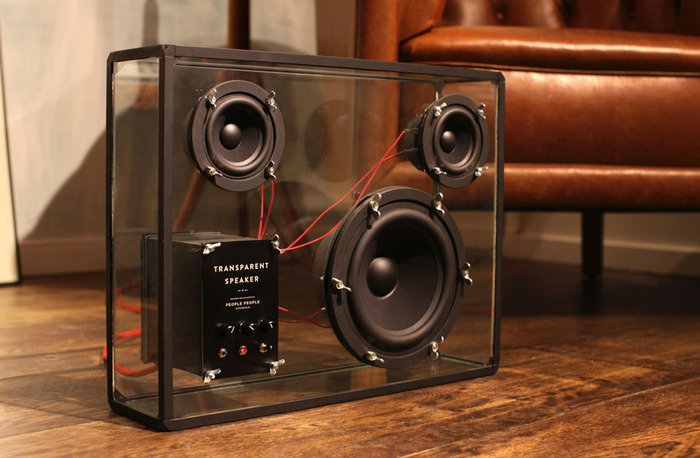 The Transparent Speaker can be pre-ordered on Kickstarter.